SimpleTech SD (Secure Digital) Memory cards are next generation memory devices that offer a combination of high storage capacity, fast data transfer rates, great flexibility and excellent security all in a memory card about the size of a postage stamp. 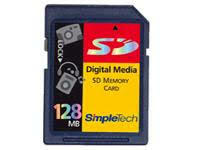 SimpleTech SD Memory Cards measure mere 24mmby 32mm by 2.1mm. Its slim, compact design makes it an ideal removable storage solution for designs ranging from pocket-sized cellular phones, audio players and digital cameras, to PDAs and set-top boxes as well as other compact or multifunction digital products. With its speedy data transfer rate of 2MB/sec, SimpleTech SD Memory Card provides high-speed response for large amounts of data. SimpleTech SD Memory Cards are non-volatile and solid-state. They also facilitate fast, simple, and secure downloading of all types of digital files from the Internet. The SD format, compliant with SDMI (Secure Digital Music Initiative) requirements, rewards the creative process of all content providers by providing high-level security to their files. Contents in the cards can be protected by CPRM based security.